Hon. Patrick Obahiagbon will not be returning to the Federal House of Representatives, when the House reconvenes after the April 2011 elections and the reason is simple; the man, popularly known as ‘Igodomigodo’ in the House of Representatives, lost at the primaries in his Oredo Federal constituency in Edo state. But how was that possible? Igodomigodo had lived a larger than life personality and his sheer oratory powers would have been more than sufficient to bamboozole any opponent into submission and withdrawal. And yet that was not the case for as they say in politics, there are no permanent friends or enemies, only permanent interests. 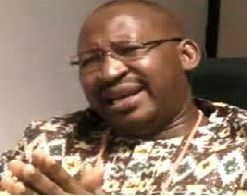 Patrick Obahiagbon, popularly known as ‘Igodomigodo,’ in the House of Representatives where he represents Oredo Federal Constituency was unique. He was indeed a brand all by himself. His brilliance has never been in doubt, as has been confirmed by those who know him closely and his gradiloquency was exceptional and sometimes dovetailed into sophisticated absurdity, but he was also a great ambassador and a fun person to behold. He is a 1987 Law graduate of University of Benin and also holds two Master degrees. When asked why he speaks big grammar, he replied in typical style thus: Sincerely speaking, I want to tender an unreserved apologia to my colleagues and all those who feel that my language is obscurantist. The truth is that I do not set out deliberately to mystify my audience, to deposit my audience in a portmanteau of indecipherability or in portmanteau of conundrum. No, no, no, no! Far from it. The cosmic force would not allow me to do that. But, you see if you ask homo sapients who have interfaced with me for close to twenty years now, they would tell you that I no longer speak high sounding language. I have reduced it radically. If you have the opportunity to listen to my speeches or debates ten, fifteen years ago, then it would have been a different kettle of fish all together. So, I am convinced that I’ve tried, I am trying and I will continue to try to ensure that my language, or my idiolect is as limpid and as diaphanous as possible. But, let me say that I am an omnivorous reader and I put my nose on the grinding stone to read for more than 7 hours a day when most innocent men are sleeping, and night marauders are doing their business. I am on my table, in my Library for 7 hours. And that has been on for over twenty years. And like I always tell people, the dictionary for me is not a reference point; the dictionary is a vade mecum, a constant companion. I spend on the average not less than an hour a day referencing the dictionary for the past twenty to twenty-five years. So don’t be maniacally bewildered if I speak most times, from what I draw while reading. But, really, the intention is not to deliberately befuddle or obfuscate my presentations on the floor. And yet, despite his qualities, he definitely will not be in the House after the April elections as he lost at the just-concluded primaries of the Action Congress of Nigeria (ACN) to Mr. Rasaq Bello-Osagie. Igodomogodo had been a factor in Oredo and indeed Edo state politics for over 12 years. He was in the State House of Assembly under the Peoples Democratic Party (PDP) for eight years and proceeded to the House of Representatives after the 2007 election which he contested and won against the same Rasaq Bello-Osagie. Bello-Osagie went to Court to challenge Obahiagbon’s victory and for two years both men were locked in legal battle. First Bello-Osagie got judgement at the Tribunal which had ordered a re-run but Obhiagbon went to the Appeal Court which upturned the decision of the lower tribunal on the ordered re-run election and upheld the appeal filed by Obahiagbon. The arrival of Governor Adams Oshiomhole rapidly led to the electoral misfortune of the PDP and enhanced the political stature of the Action Congress of Nigeria (ACN) and having seen the writing on the wall that PDP candidates will experience great difficulties winning elections in Edo State, Obahiagbon, at a rally, said he was ‘politically adjusting’ to the ACN to join in the development strides of Governor Adams Oshiomhole. His move to the ACN sent cold shivers down the spines of Bello-Osagie who was already in the party. What even worsened the fears of Bello-Osagie at that time was the rumour that the party had promised Obahiagbon an automatic ticket as a pre-condition for decamping from the PDP to the ACN. Thus, sensing that his long overdue dream of becoming a federal legislator was under threat once again, Bello-Osagie embarked on a concerted campaign to butress the fact that he was the man on ground in the party and not Obahiagbon, who just arrived and his campaign yielded fantastic dividends as the results of the January 12, 2011 primaries of Oredo Federal Constituency saw Obahiagbon roundly defeated. Obahiagbon won only one ward out of the 12 wards in the constituency and lo and behold, the Igodomigodo of Africa was gone. What a great loss to Nigerians! One admirer puts it like this: “I thought I had seen it all but I had the pleasure of seeing this legislator on AIT and I have been hooked since. The man is a marvel and true to Nigerian norms, he has been given a nom de guerre” With the defeat of the flambouyant politician, the battle of who represents Oredo Federal Constituency will now be among three contenders who had not held any political office before. The three contenders are Mr. Sunny Aguebor who is contesting on the platform of the Labour Party (LP), Omorogie Ogbeide-Ihama of the PDP and Bello-Osagie of the ACN. Aguebor and Obahiagbon first crossed swords in 2007 when both men had contested the primaries of the PDP. That experience left a very bitter taste in Aguebor’s mouth because a day to the primaries, he was suddenly arrested by the police and detained throughout the day of the primaries only for him to be released to learn that he had lost to Obahiagbon. Ogbeide-Ihama on the other hand had in 2007 also contested for the House of Assembly in the PDP and lost at the primaries. Bello-Osagie is an accountant-turned businessman. Aguebor lived in Japan for 22 years before returning home to establish businesses in the petroleum industry, tourism and agriculture while Ogbeide-Ihama is the Nigerian representative of Core Energy Services, an oil and gas service firm. And the three men have already started talking tough in the absence of Igodomido. Aguebor for example believes that the outcome of the primaries of both the ACN and PDP will sway vote for him at the polls. He said the outcome of the 2011 polls would be determined by the people and not the platform on which the individual is contesting. According to him: “With what is happening in Edo State, people are beginning to know that it is not about political parties anymore. People are looking at the candidates. If you look at the processes that threw up the candidates in other political parties in the state you will realize that people are angry.” Speaking further he says: “People are happy that I came out. People see me as a man and know my pedigree. There is a lot of emphasis on the individual contesting the election and not the party anymore. The issue at hand is not the ruling party or the opposition party. I know that people are interested in effective representation. Based on that, a lot of judgment will be done on individual basis, on the ability to represent and take the yearnings of the people to the National Assembly. Aguebor has no doubts about the real factors that will determine who carries the day; “Antecedents”, he says “will come into play. Generational change will come into play; qualification, awareness, charisma, ability to mingle among legislators and being able to drive home the yearnings of your people will come into play. Our people will make assessment of all those vying for the position.” For Bello-Osagie, politics is about developing the lives of the people through proper representation. The three contestants are rich and they are battling in a terrain where the PDP had always found it difficult to win elections since 1999. Analysts say it is difficult to predict where the votes will swing as all of them are deeply rooted among the voters. Bello-Osagie would rely on the performance of the ACN government led by Governor Oshiomhole to persuade voters. Ogbeide-Ihama according to some political analysts will preach that he represents a new PDP, while Aguebor will likely tell the people that LP is for them. But as the people of Oredo Federal Constituency wait for the day when they will choose their representative in the Federal House of Representatives, many of them will surely remember, with great nostalgia and pride that the once had a man who brought the attention of Nigeria and indeed the whole worl to Oredo and Edo state, wheever he stood up to talk. That man was none other than Patrick Obahiagbon, the Igodomigodo of Africa.